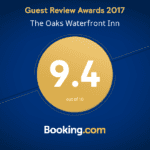 The well-appointed waterfront inn rooms and cottages at The Oaks offer romantic luxury and exceptional comfort. Thoughtful amenities and attentive service assure every need is fulfilled. Do as little or as much as you would like. 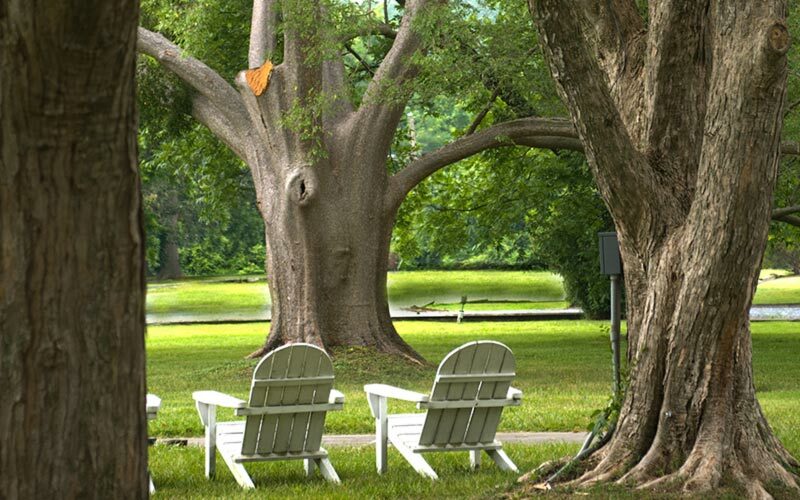 Relax on our Adirondack chairs, take it all in from a private veranda, or wander the lush grounds. Our circa 1748 Inn offers different sized rooms – some with Queen beds and some with King. Furnished with antiques, all rooms feature modern bathrooms, some with jetted bathtubs. Many of our rooms feature gas fireplaces seasonally. All rooms are equipped with irons and ironing boards, hairdryers and toiletries. Our ADA compliant luxury waterfront cottage boasts a large bathroom, living room, kitchenette and king sized bed. Forget something? Inquire at the front desk. Daily housekeeping is provided. 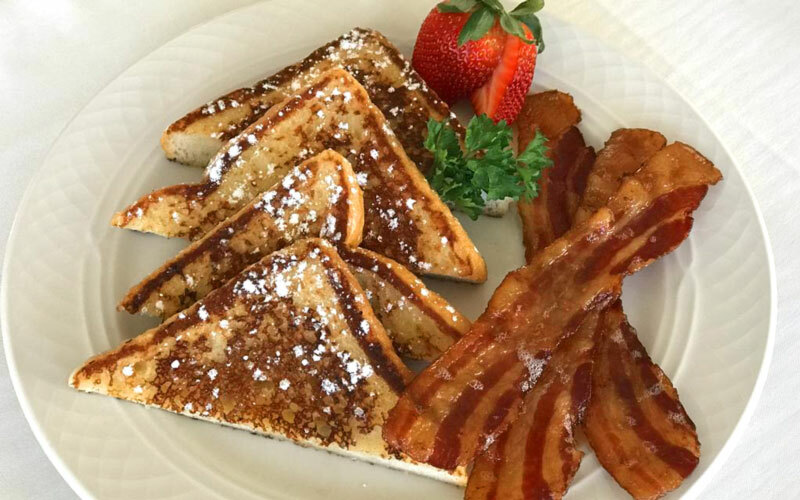 Every morning is not only met with stunning views of Oak Creek, but also a hot breakfast with seasonal fresh fruit, homemade croissants, and a choice of a savory or sweet hot entrée, such as French toast, savory pancakes or omelets sure to leave you with no room for lunch. Enjoy your breakfast in the dining room, or take a cup of coffee out to the terrace for a better view of the creek. Complimentary beverages are offered in the living room area. 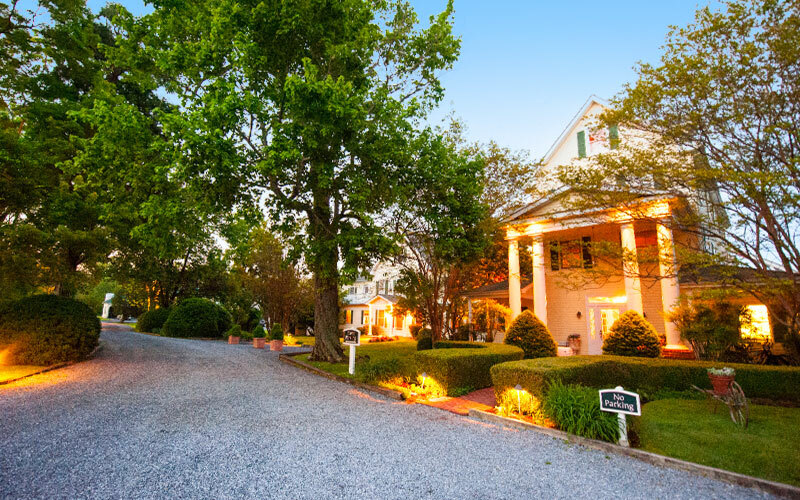 Come relax in the tranquil beauty of Maryland’s Eastern Shore and the gracious hospitality of The Oaks Waterfront Inn! Swim in our pool, bicycle on our beach cruisers, putt on our greens, and enjoy crabbing and fishing off of our private dock. Experience the beautiful sunset while canoeing in peaceful Oak Creek, an inlet of the Miles River. 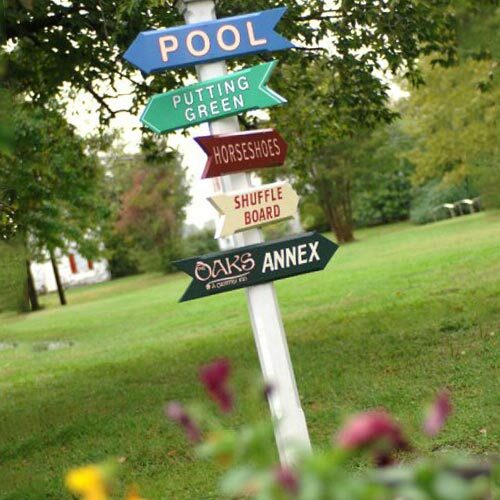 Enjoy a game of shuffleboard, badminton, horseshoes, or volleyball. 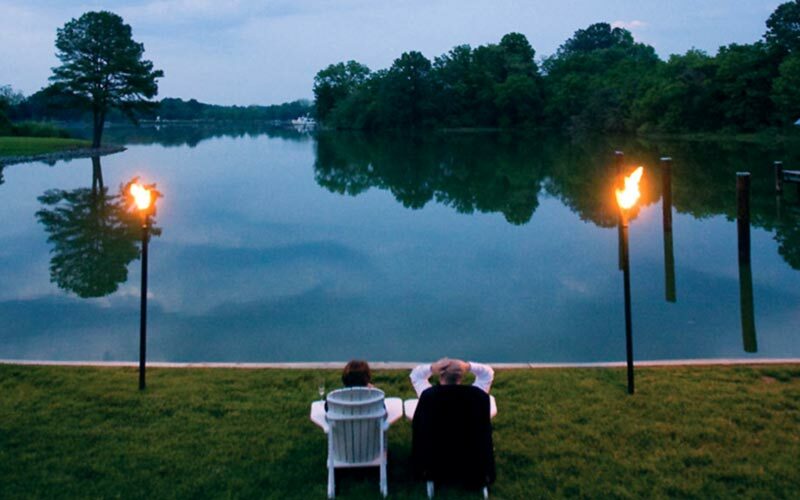 Or, simply enjoy a glass of wine waterside in one of our Adirondack chairs. Great Blue Herons, Ospreys, and transient Canada Geese are frequently spotted from our shoreline. Occasionally, we are treated to a Bald Eagle sighting! 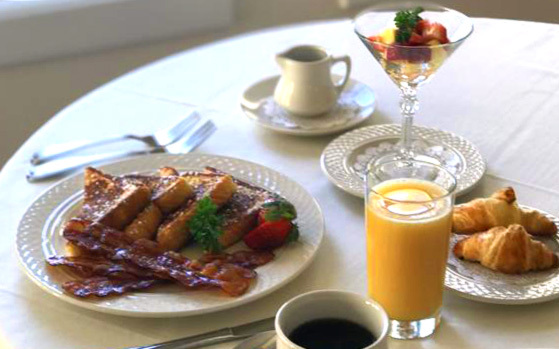 Main House guest rooms range from $110 to $300 a night (a full breakfast is included in the room rate). Please call 410-745-5053 for more details. Visa, Mastercard, American Express, Discover, Cash or Check are accepted. A 6% Maryland sales tax and 4% Talbot County Room Tax are applied to all room tariffs. Call us for guaranteed lowest rate at 410-745-5053. Reservations are guaranteed with a major credit card. Cancellations should be made 1 week prior to your stay (2 weeks for Cottage) or you will be charged for one night’s stay if we are unable to rebook. Check In : 3:00p.m. to 5:00p.m. If you are planning to arrive after 5:00 p.m., please call the front desk to make late arrival arrangements. Please check out by 11:00 am. Please inform us of your cancellation at least 1 week prior for guest rooms, 2 weeks prior for the cottage. Breakfast is typically served at 8:30 a.m. on weekdays and from 8:30 to 9:30 on the weekends. We will make every effort to accommodate other times with advance notice. Please let us know of food allergies and intolerances. Although The Staff of The Oaks Waterfront Inn loves pets, some of our guests do not share the same affections. We are unable to allow pets at The Oaks but are happy to provide you with some great boarding options in the area. The Oaks is a smoke free facility. Smoking is permitted outside the Inn. Rooms are based on double occupancy. We can arrange for air mattresses and breakfast for any additional guests. Charges for additional guests vary based on age. Breakfast included daily. Lunch Sandwich Menu available for our guests. Choose a bottle of our house white wine or sparkling to compliment your stay. Sparkling cider also available. A variety of different cheeses paired with assorted crackers are the perfect complement to a relaxing evening. Our Chefs Assortment of delectable pastries and cookies will be waiting in your room when you arrive. (Seasonal Availability) Experience the Chesapeake Bay onboard the national historic landmark the Rebecca T. Ruark. Hoist the sails, steer to an oyster bar and dredge for oysters as you learn about the bay from a 3rd generation skipjack waterman – the infamous Captain Wade! I have been traveling across the country for the past 30 years, and I can honestly say that this was the most memorable lodging experience that I've ever had. The inn keeper was very friendly and welcoming. I felt like I was visiting family. I will be returning soon. Friendly atmosphere, quaintness, excellent service. The breakfast was wonderful, the grounds were beautiful, the room was amazing, the fireplace was a nice surprise. Stayed an extra day. 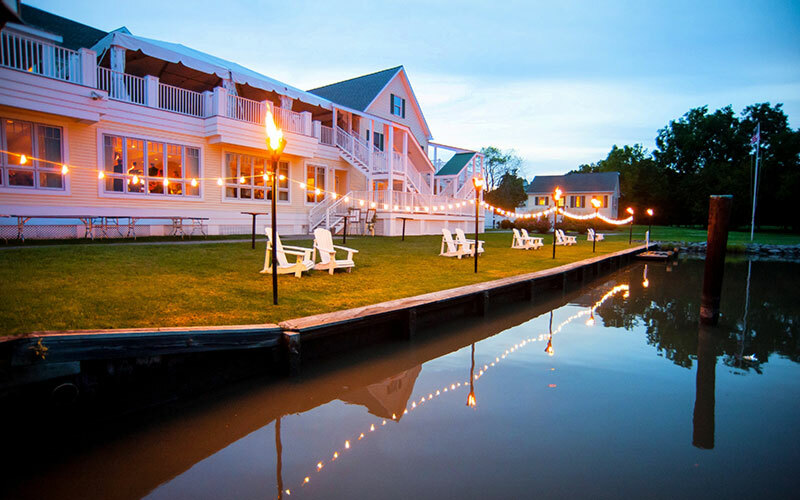 This enchanting Inn is the perfect getaway place to stay for a few days of rest and relaxation.